By accessing this web site (www.InspectionArsenal.com) and/or purchasing products from Phillips Precision, Inc., you agree that you have read, understood and agree to be bound by all of the provisions set forth herein and below (collectively, the “Terms and Conditions”), all of which constitute an agreement between you and Phillips Precision Inc. The unenforceability of any one of the Terms and Conditions shall not affect the enforceability of any of the other Terms and Conditions. The terms and conditions on any quotation, order acknowledgment, invoice or other form you receive from Phillips Precision, Inc. are incorporated into these Terms and Conditions by reference. These Terms and Conditions constitute the exclusive agreement between you and Phillips Precision, Inc., except as otherwise agreed in writing signed by us. Our failure to assert a right or insist upon compliance with any term or condition shall not constitute a waiver of that right or excuse any subsequent noncompliance. Phillips Precision reserves the right to change these Terms and Conditions by posting a revision on this website. Under no circumstances shall Phillips Precision, Inc. be liable in contract, warranty, tort or otherwise for any special, exemplary, incidental or consequential damages that result from your purchase of any products from Phillips Precision, Inc. or any use of or the inability to use any content or products from Phillips Precision, Inc. In no event shall our liability exceed the purchase price of the products you purchase from Phillips Precision, Inc. It is the user’s responsibility to inspect all products to determine if they are per your required specification. It is understood by you the end user that plastic clamping components, magnets used in fixture plates, and other inspection components have limited functional life spans. In no way shall Phillips Precision, Inc. be liable for damage to equipment, personnel or death for products used past their functional lifespan. In no way shall Phillips Precision, Inc. be liable for machinery down time, property damage, product damage, inventory damage or any other charges incurred by you the user for products used past their functional lifespan. It is the user’s responsibility to determine proper use of and safe protection from Phillips Precision, Inc.’s fixture components. User’s employer and OSHA policies should be followed for Personal Protection Equipment related to the use of said fixture components in their quality inspection department. In no way shall Phillips Precision, Inc. be liable for any costs, machine down time, injuries, or deaths resulting from the improper setup or use of said fixture components. If dropped, Loc-N-Load™ and Open-Sight™ fixture plates can become damaged, can damage other equipment, or cause injury. 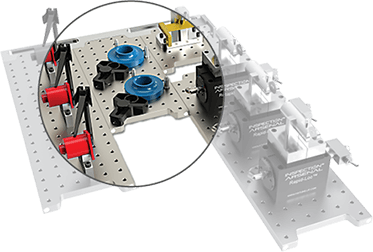 Rare earth magnets are used in Loc-N-Load™ and Open-Sight™ fixture plates and can interfere with devices such as cell phones and pace makers when in very close proximity. It is the user’s responsibility to determine proper use of and safe protection from said fixture plates and magnets. User’s employer and OSHA policies should be followed for Personal Protection Equipment related to the use of said fixture plates in their quality inspection department. In no way shall Phillips Precision, Inc. be liable for any costs, machine down time, injuries, or deaths resulting from the improper setup or use of said fixture plates. These Terms and Conditions shall be governed by and construed in accordance with the laws of the Commonwealth of Massachusetts applicable to contracts made and to be performed in Massachusetts, without giving effect to conflict of law principles, and applicable federal law. Any personal information submitted will be subject to these laws, not those of any jurisdiction outside of the United States. You irrevocably consent to the exclusive jurisdiction of the courts located in Massachusetts in connection with any action arising out of or related to these Terms and Conditions or this web site. Notwithstanding the foregoing, proceedings to enforce the result of any such adjudication may be brought in any applicable forum. Phillips Precision, Inc. warranties its products to be free from defects in materials and workmanship for a period of 60 days from the date of original purchase. Phillips Precision, Inc. agrees to repair, or at our discretion, replace tooling supplied by Phillips Precision, Inc. which proves to be defective in materials or workmanship. This warranty is limited to defects arising from normal usages and does not cover any malfunctions or failures resulting from misuse, abuse, neglect, alteration, modification or repairs by other manufacturers. You must contact Phillips Precision, Inc. for authorization prior to returning any items from your order. Returned items must be new, in original packaging and show no signs of wear, damage, abuse or alteration. Failure to meet these conditions may cause your request for return credit to be denied. Same day shipping is available as necessary. Orders placed online prior to 2pm Eastern time Monday – Friday (excluding holidays) with UPS as the shipper can ship the same day. Due to carrier pick up Fed-Ex orders may require 1 additional business day for shipping. Phillips Precision, Inc. has the right to delay your shipment and upgrade your shipping method to meet your originally expected delivery date at no charge to you the customer. Phillips Precision, Inc. will notify you if there is a delay in expected delivery. Average lead time for a back ordered standard item is 2-3 weeks; however, custom fixture plates and components may require 6-8 weeks or more. Prior to ordering any item that is on back order you should inquire about expected delivery. While we do our best to provide accurate lead times, due to conditions beyond our control lead times may be increased. For large orders we recommend you call to check stock. Back Orders are fulfilled on a first-come, first-served basis. Domestic orders: Domestic orders containing out of stock items will be shipped in multiple shipments. All in stock items will be shipped immediately while back ordered items will be shipped as they become available at no additional charge. International Orders: International orders containing out of stock items will be held until all items are available due to shipping, duty, brokerage and import tax fees. In the unlikely event that the delivery carrier you choose does not deliver your order on time or loses your order, Phillips Precision, Inc. will file a claim on your behalf, but cannot be held accountable for that loss. All orders are shipped with insurance for this reason and the carriers accept full liability for these orders. The claims process for both UPS and Fed-Ex is based on their standard policies upon opening an investigation. In most cases packages are located and delivered as quickly as possible. Refunds for late deliveries cannot be given with the exception of guaranteed UPS & Fed-Ex Expedited Services. Those refunds are at the discretion of the carrier. We try to be accurate while listing our items on our website; however, from time to time our product listings may contain typographical errors, inaccuracies, or omissions that may relate to product descriptions, pricing, and availability. Phillips Precision, Inc. reserves the right to correct any errors, inaccuracies or omissions and to change or update product information without prior notice (including after you have submitted your order). All content on this site (www.inspectionarsenal.com) such as text, graphics, logos, buttons, product images, videos and digital downloads is the property of Phillips Precision, Inc. and protected by the United States and international copyright laws. The compilation of all content on this site (www.inspectionarsenal.com) is the exclusive property of Phillips Precision, Inc. and protected by the United States and international copyright laws. Phillips Precision graphics, logos and buttons are trademarks and may not be used in connection with any product or service that is not Phillips Precision, Inc.’s, in any manner that will likely cause confusion among customers, or in any manner that disparages or discredits Phillips Precision. All other trademarks not owned by Phillips Precision, Inc. that appear on this site are the property of their respective owners.